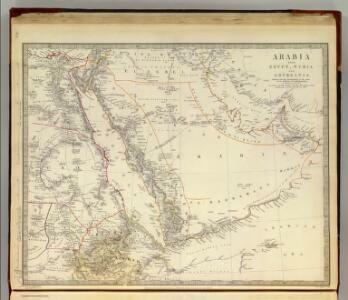 1 : 8870400 Letts, Son & Co.
Arabia, Egypt, Abyssinia, Red Sea. 1 : 10000000 Menke, Th. 1 : 11000000 Arrowsmith, Aaron Jr.
152-153. Arabian Peninsula. Bahrein (Bahrain) Islands. The World Atlas. 1 : 11200000 Tallis, J. & F.